I hadn’t thought that I would fall in love with the desert that easily. We, the children of Europe, grow up in milder climates, among grass and trees the morning covers with dew, and we are not accustomed to the vastness, the emptiness, the extreme. And I had spent quite a lot of time in California already, but always by the seaside –the dryness and the emptiness I had only guessed, through small dust patches forgotten between the pristine lawns and the lush flower bushes. I imagined that empty, burning soil, miles and miles without a shadow or a tree, and I couldn’t imagine that it would come to thrill and fascinate me the way it did at first glance. 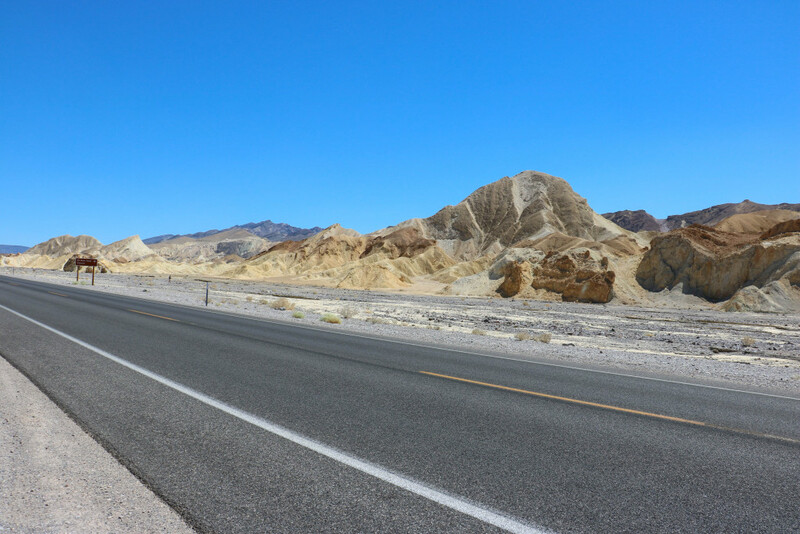 Cruising through Death Valley National Park. I had left Vegas in the early hours, and had stopped in Pahrump for some gas. 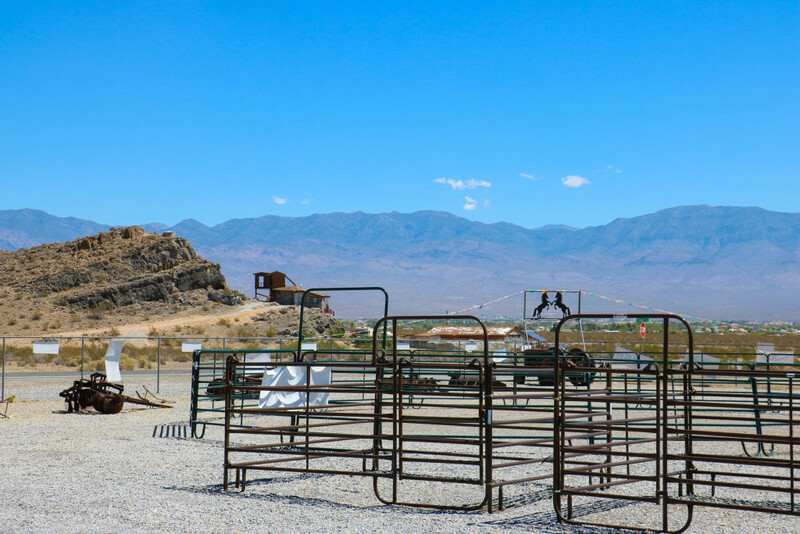 On the outskirts of the town, there was a shop selling equestrian gear and typical cow-boy stuff, with a real-life sized plastic horse standing alone in the dust. It had already started to look like my Wild West fantasies, like gold rush and ghost towns. 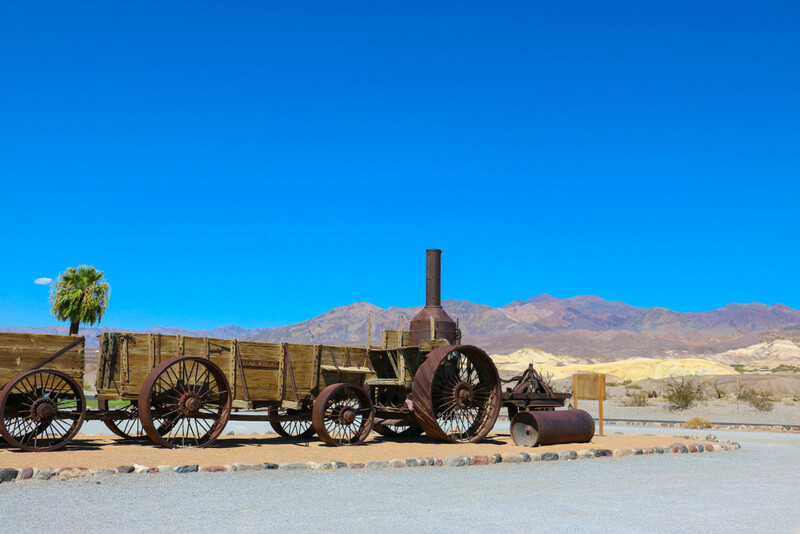 I carried on towards Death Valley Junction, and the towns became sparse. There were barns, and rusty water tanks up in the air, just like in the movies, and the rough, sandy air had peeled off the letters on the sign which said “California”. This was the other side of the moon, the brassy threat you found when you flipped the golden coin. 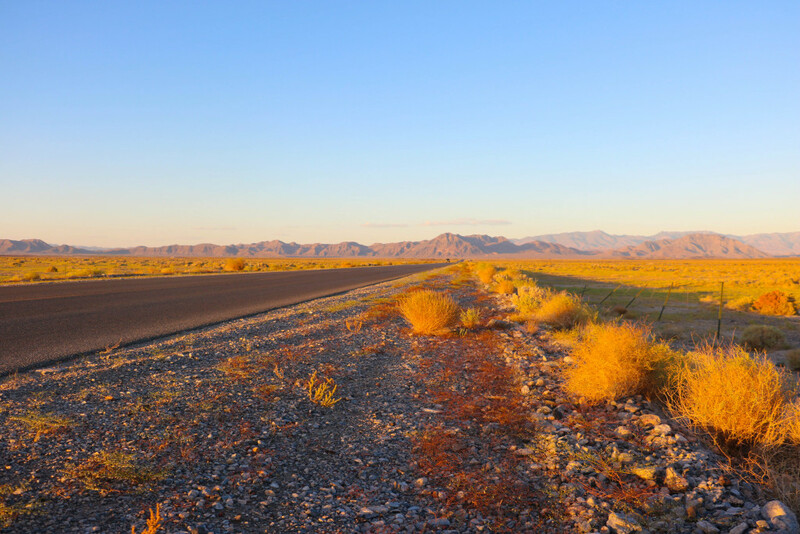 I had read about the enormous valleys I was now driving through – these seemingly endless flat lands of arid and cracked soil expanding between the mountain ranges, deadly mirages to the pioneers who once roamed around these lands. In such emptiness, all sense of scale was lost; they saw the faraway mounts across the valley and thought they could make it in a day or too. And then the desert devoured them. Bones of horses and men, bleached by the salted dirt and the merciless sun. A few days before this trip to Death Valley, a French couple had died in Whitesands Desert, New Mexico. It was in August, and they had gone on a short and popular hike, following one of the National Park’s marked out paths. They had only brought one bottle of water with them, and the blazing summer heat caught them halfway. They gave their young son the last water drops, then they collapsed. The rangers found the boy curled up in a ball, dehydrated and burnt, but alive. Both parents dead. This is something Europeans have long forgotten, maybe a thousand years ago, when we leveled the deep dark forests and dried the peat bogs, or maybe we’ve never even known it. That the land can eat men up. Another thing I hadn’t expected was the heat. I thought I was accustomed to it, as a child of Provence, the dry and sunny southern part of France. But I didn’t know what “heat” means until I set foot in Death Valley. The heat felt almost alive, like a wild beast grasping my ankles, like a furry, dangerous thing clinging on to me, knocking me to the ground. 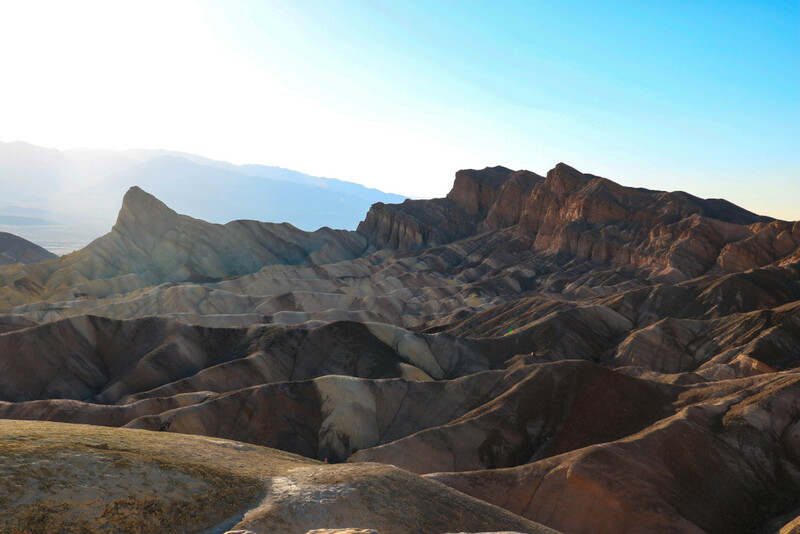 I have read that in Death Valley, the rules of thermodynamics seem to have ceased to apply: instead of following its usual way up, the heat gets caught up in a vortex, and descends back to the ground, creating a blazing whirlwind. 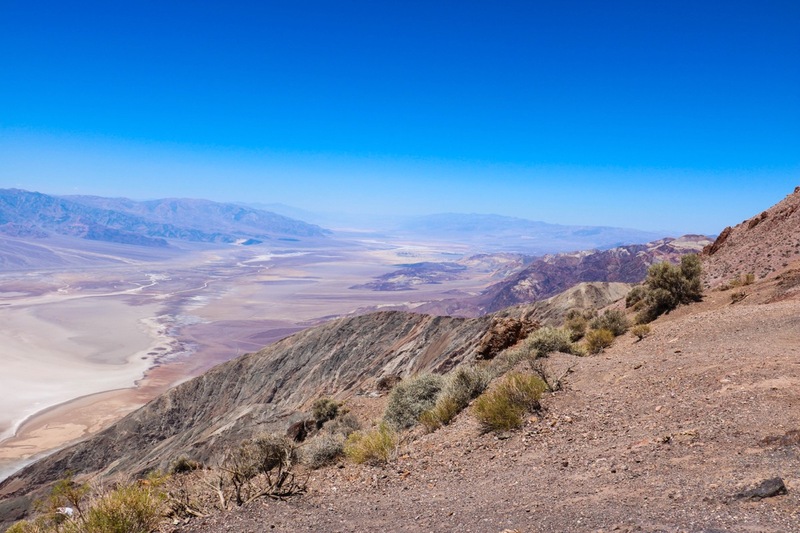 The temperature reached 49°C (120°F) that day, and the highest temperature ever recorded at Death Valley – on Earth, actually – was 56,7°C (134°F). I had never thought air could become my enemy, that it could burn my lungs as I breathed, as if the oxygen had caught fire. But the colors stand in flames too, and this is one of the most dazzling sights I was ever blessed with. The color palette on Artist’s Drive. Maybe you already know the tale: Death Valley was named by a group of lost wanderers, miraculously saved from their impending doom, and crying out in relief: “Farewell, valley of death!” Their cracked lips and their parched tongues were probably muttering Psalm 23 in their last breath: “Though I walk through the valley of the shadow of death, I will fear no evil…”. 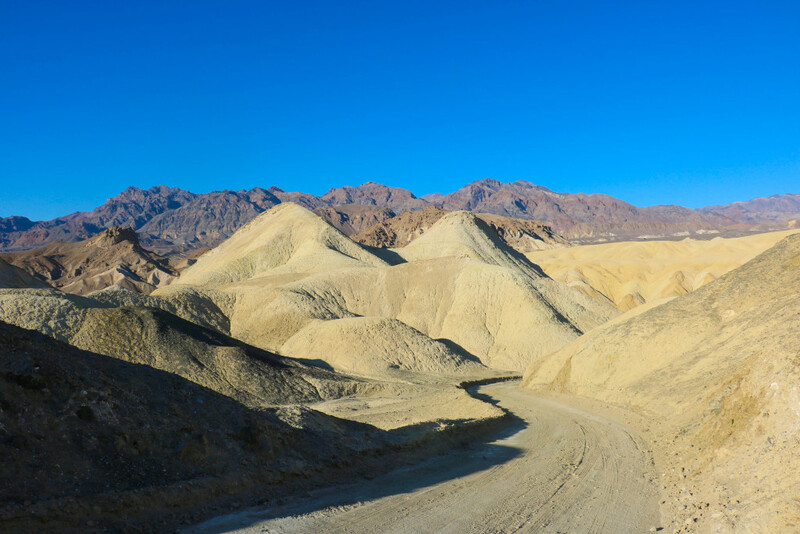 Those who named the various spots seemed to find solace or relish in expanding on the infernal terminology, since a map of Death Valley looks like a collection of hellish hyperboles. There’s Dante’s View, the dazing viewpoint terrace over the deep and wide valley. 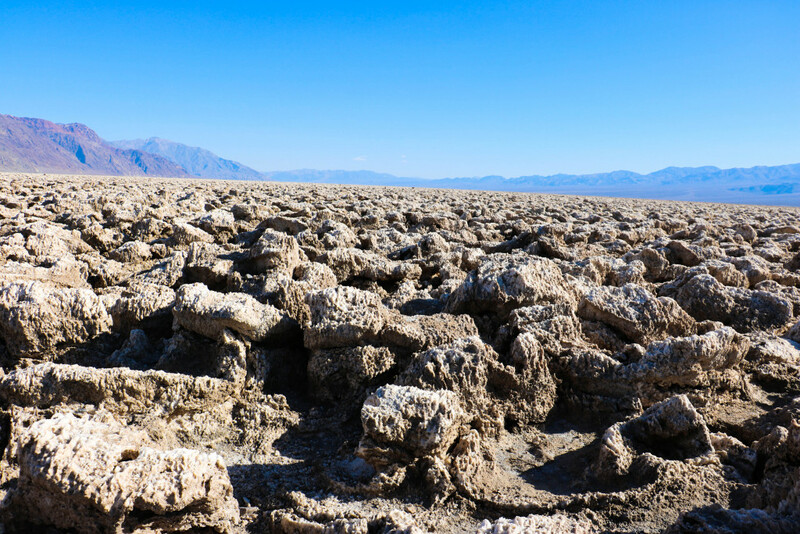 There’s Devil’s Golf Course, with its treacherous salt formations which turn the ground into a field of sharp razorblades with extraterrestrial shapes. 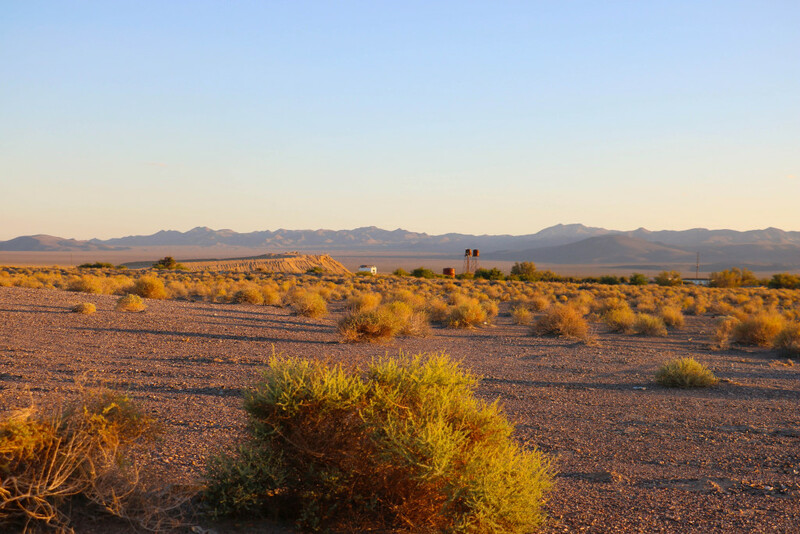 There’s Furnace Creek, the lonesome oasis amid the red death, hometown of the borax miners, with its visions of a long-gone American past. But the Timbisha Shoshone, Death Valley’s native tribe, say the settlers should have talked to them, instead of trying to burn their secular culture to the ground. They were the ones who knew the paths, the shelters and the wells. They had inhabited this harsh land for centuries, and they could have helped the foreigners to find the “valley of life”. The little sign says “Sea level”. We are literally at the bottom of the pits. 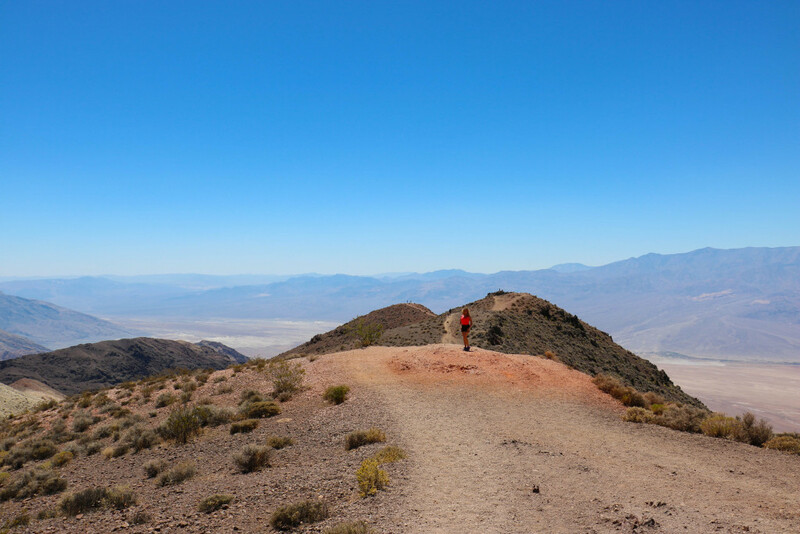 Still, there is no place like Death Valley to make you think of the end of the world. I saw recently that one of NASA’s telescopes had caught footage of our fate to come, in 4.5 billion years, when our sun will die. They saw a white dwarf – a star in its ultimate death throes – preying on one of the planets in its orbit, snatching rocks and stones, like an ogre tearing shreds of flesh, until it gulps down its barren core and feasts on its last remains. The books and the graves, the church towers and the endless seas, they will all burn on our sun’s funeral pyre. The ghost towns, which boomed for a few years during the gold rush, and were then left to decay, look like a prophecy. I reflect on it when treading on the glowing ground. On Earth’s death and mine. Nighttime worsens the dizziness, but somehow soothes the pain. Night skies in the desert, far away from city lights – immensity wearing its finest adornments. You can’t see the void and the fear anymore, the black holes erasing galaxies and stars eating stars, only this infinite ocean of light. Suddenly nothingness nearly looks shiny and peaceful. Treacherous, uneven salt beds of Devil’s Golf course. 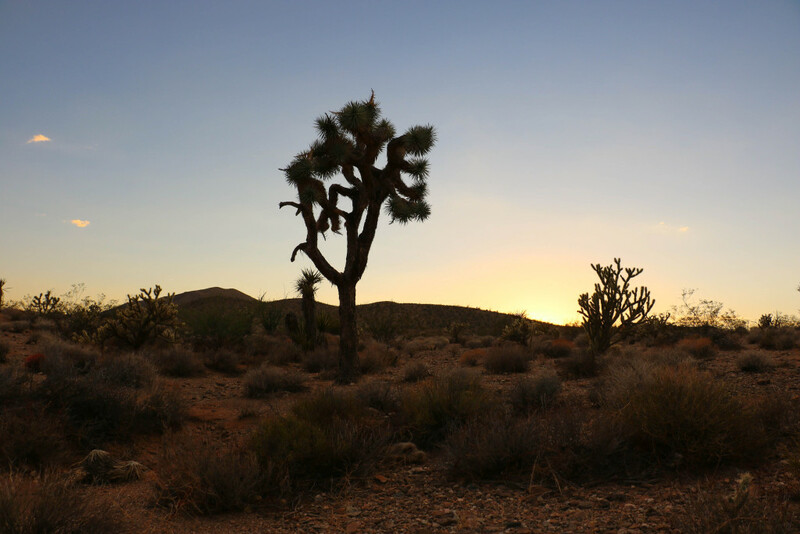 Further away from the furnace’s heart, where the trees shyly rear up their heads again, I will behold them for the first time: Joshua trees. They look like they asked the Gods to multiply their manifold arms, so that they could throw more hands up to the sky, and pray more intently. I have to come back to the land of the living, driving in silence and awe on lonely, dusty roads. The road – that’s why we, Europeans, keep on coming back to the U.S. Fate and will suddenly become tangible when embodied by those immense landscapes. Now it’s in our reach, or so we hope. Our destinies are magnified by the filmic light. Wider horizons, higher hopes and dreams, we want to believe in them. We all turn into Joshua trees, imploring an unknown God with no face nor name. Or maybe into those dead riders following the wrong star, trying to get across the sierra. There is something in California which compels me, which calls my name across the deep sea – or so I want to believe. It makes me want to dig something out of this fallow mind, as if I had to treat myself like a gold or borax mine. It makes me hope that something is about to take shape. Maybe this is what I saw on the naked, burning grounds of Death Valley: old shells of the self, left to rot in the sun, and promises. Me, standing over the inferno at Dante’s View. I lost my heart in Death Valley. Please share it or pin it! I’m so, so glad you enjoyed Death Valley and Joshua Tree. It’s interesting to hear a European’s perspective on it. I really love Death Valley as well. 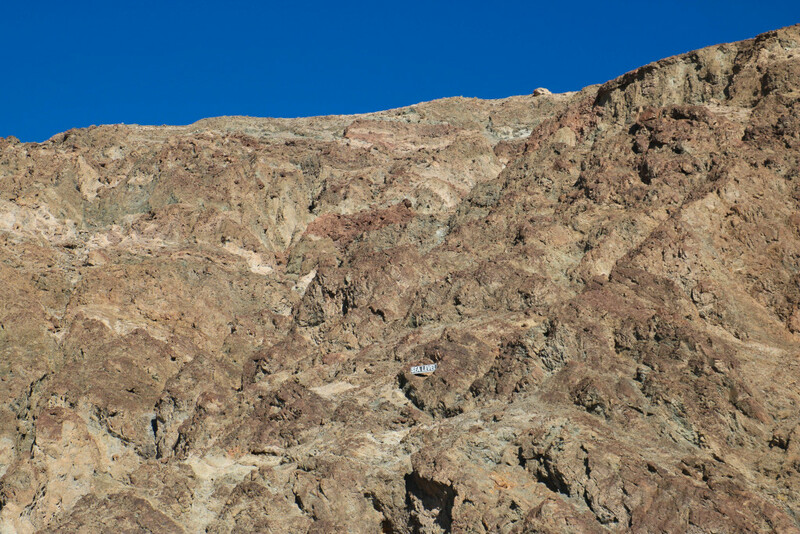 Funny enough, I just posted Monday on Death Valley. Great photography as well. Thank you! Wow! Spectacular portrait of Death Valley produce by beautiful photos and vivid prose. Thank you so much, Kelly! I really enjoyed your blog! I visited almost all these places you’ve been mentioning too! 🙂 I still cannot believe how lucky I was to visit this place. I am pretty sure you will inspire many people to head to DW by this post. You took a very nice pictures! Nika, thank you for your comment which allowed me to discover your great blog! We have so many tastes in common: the great wide Southwest! Arizona, Utah, California, I follow you 😉 Have a lovely day! 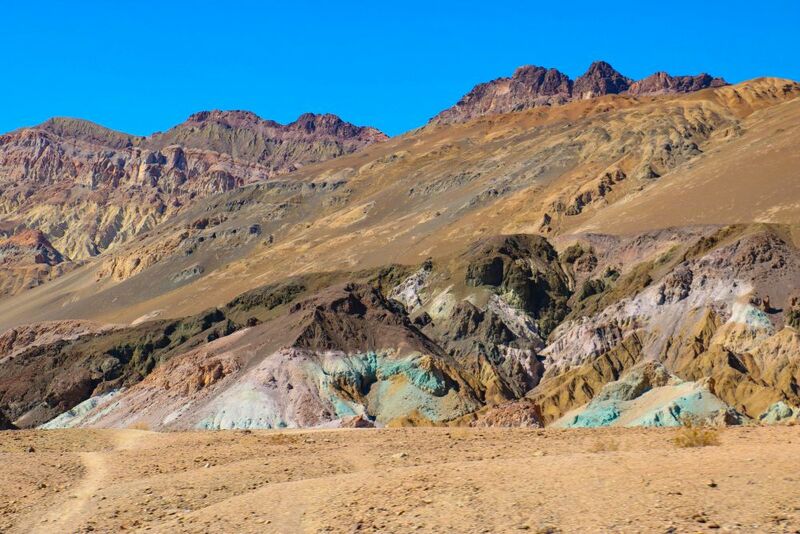 Comme toujours, jolies photos qui reflètent très bien l’ambiance qu’il règne dans la Death Valley. Et aussi, je n’avais pas encore eu l’occasion de te le dire, bravo pour l’écriture du blog en anglais et en allemand ! Chapeau bas… ça m’impressionne à chaque fois ! Wow, ce paysage est magique. La prochaine fois que je retourne a Las Vegas, je pense y faire un tour. Tres beau post !